PRCA Xtreme Bulls 6:30 p.m. This is an all bull rides evening! Slack, Free Admission 8 a.m.
Breakfast Concessions open 7 a.m. 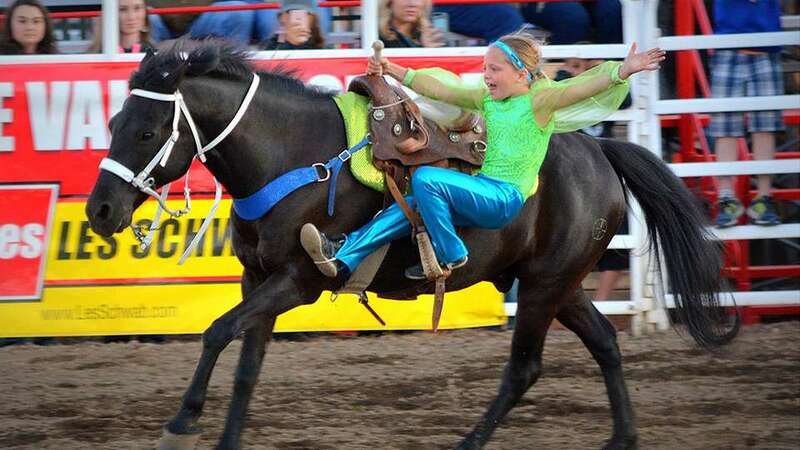 Afternoon Rodeo Performance 1 p.m.
Evening Rodeo Performance 7 p.m. Final Rodeo Performance 1 p.m.
Kiwanis Buckaroo Breakfast 7-11 a.m. Cowboy Church Service 9 a.m.
A shuttle bus will be running from Sisters Elementary School to the Rodeo Grounds Wednesday, Friday, Saturday & Sunday, every 15 minutes, starting 2 hours prior to performances, as traffic allows. Water and a wide variety of food and beverage are available for purchase inside the rodeo grounds. No reusable water containers or outside beverages may be brought into the Sisters Rodeo Arena. All bags and backpacks are subject to search at the ticket gates.